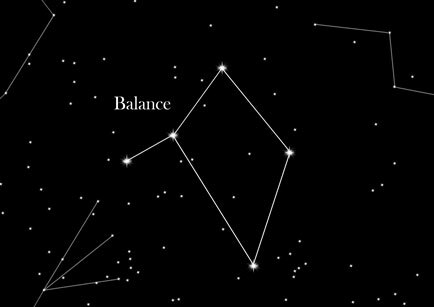 Libra, or 'The Scales', is not the best defined constellation in the sky, despite containing a binary star system. Libra is a constellation which can be observed in the Northern hemisphere from January until July. Although it consists of faint stars, its brightest star is Zuben el-Schamali (the 'northern claw'). Inexperienced star gazers may find it difficult to work out the shape of The Scale and it often requires a lot of imagination to picture the constellation's shape. The sun appears in the constellation from October 31 until November 23, and Libra is well-known as a sign of the Zodiac. Libra is located between the constellations of Virgo to the east and Scorpio to the west. Zuben el-Schamali is the constellation's most easily visible star, forming the basis for the 'balance' component of The Scale. This star is a blue dwarf, and is located exactly on the apparent ecliptic of the sky. A notable feature of Libra is its 'Bar Star', or Alpha Librae, which is actually a binary star system. This phenomenon can be observed relatively straightforwardly from Earth using binoculars. The ancient Sumerians knew the constellation as the Scale, though the origin for this name is unclear. Some suspect the name may relate to the Autumnal Equinox, which at the time was when the sun passed through the constellation and the length of day and night was 'balanced' equally. It could also be derived from the shape of beam balances used by tax collectors at that time. Both the Babylonians and the Greeks referred to the constellation as the 'Claws of the Scorpion'. The Romans later identified Libra as the scales of justice held by the goddess Astraea. Astrological significance: People born under this sign of the Zodiac are usually considered open-minded and intelligent. They often pursue a variety of projects with enthusiasm, but can appear a little unbalanced. Their diplomacy and willingness to help others often mean that they are widely regarded with affection. Libra's element is the Air.